Owners of small dogs know that in spite of their small stature, these pets can often experience a great weight on their shoulders: many small dog breeds are prone to arthritis and related joint diseases. These problems can limit their mobility and cause them intense, chronic pain. Rather than wait until your dog can't run or walk, provide your pet with a clinically proven joint care solution to treat or prevent joint degeneration and the tribulation it brings. 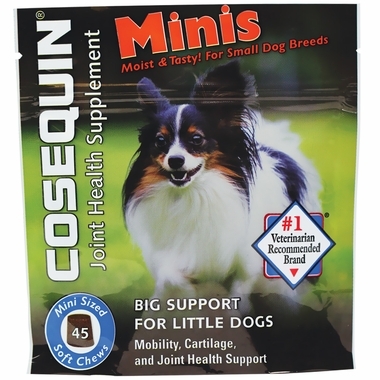 Cosequin Mini Soft Chews offer the same trademarked glucosamine and chondroitin compounds as classic Cosequin and Dasuquin products in a delectable and easy to administer miniature soft chew. It’s these trademarked ingredients that separate Cosequin from all other glucosamine and chondroitin supplements. These compounds, when combined with manganese ascorbate, have been clinically proven to be effective for the management of arthritic conditions. FCHG49® Glucosamine and TRH122® Sodium Chondroitin Sulfate are specific forms of popular compounds selected for their unique composition. TRH122 features a low molecular weight that is unmatched by other variations of chondroitin. These specific compounds were specially selected for their bioavailability, meaning that they are more readily absorbed by your pet's system. These proprietary compounds act as chondroprotective agents, meaning they protect cartilage from the potentially adverse effects of non-steroidal inflammatory drugs (NSAIDs). One third party clinical trial showed improved cartilage metabolism and reduced matrix breakdown in dogs treated with popular NSAIDs when the therapy was combined with these principle ingredients of Cosequin. This suggests that Cosequin may prove useful as adjunct therapy with these popular joint medications. Furthermore, these chews contain methylsulfonylmethane (MSM) to further assist in the treatment and prevention of osteoarthritis and green tea extract to relieve the pain caused by rheumatoid arthritis. It’s this selection of synergistic, uniquely effective compounds that make Cosequin the #1 veterinarian recommended brand for small animals; and yet, Cosequin's commitment to quality doesn't end at its selection of ingredients. To ensure Cosequin's efficacy and purity, Nutramax ensures that each bag of these chews meet GMP Manufacturing standards. These standards demand regulations be met at each level of the manufacturing process to ensure that the final product is pristine, safe and effective. This means that each of the raw materials used in the product is quality tested to root out inadequate materials and that the final product itself is tested again. This incredible formula is now packed into one miniature soft chew with a delectable, natural flavor that dogs love. These chews are currently available in a package that includes 45 of the miniature soft chews. This package provides a 3-6 week supply of the chews to ensure that dogs have joint protection at an affordable cost and is resealable to ensure that each chew stays fresh down to the last treat.